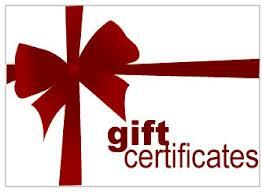 Gift certificates may be used like cash toward the purchase of show tickets at our box office. Change will be given in certificate value, rather than in cash. For example, if a $20 gift certificate is used to purchase a $14 ticket, a $6 certificate will be given as change. Gift certificates will be honored on a first-come-first-serve basis. As always, seats cannot be guaranteed without advance reservations.